Is Facebook Really a Good Place for B2B Marketing? This weekend I reached out for a replay of "The Social Network," and it got me thinking: Do we overplay the value of Facebook in B2B marketing? Granted, in the Aaron Sorkin screenplay and David Fincher (Director) movie, it's all about the characters who invented Facebook and the remarkable events that continue its growth in popularity today. But something that might be missed by marketers who try to leverage Facebook's amazing sheer volume of subscribers—it was never intended as a marketplace. If we pay attention to Facebook's roots, maybe we can better understand why it befuddles even the most seasoned social marketer today. 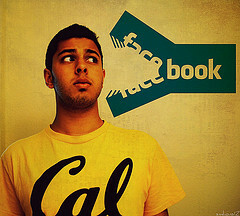 Yes, you can advertise on FB, but is that really a smart move? Yes, you can promote your business through a company Page and a bunch of "likes," but what does that really accomplish? I think we marketers are chasing our tails on Facebook because it was never meant to be a place of business, and most users like it that way. What was the original Facebook concept? I'm always amazed at how sleazy Facebook's beginnings [apparently] were, even if a bit exaggerated in the movie. Jesse Eizenberg, who plays the irrepressible Mark Zuckerberg, is basically finding ingenious new ways to thumb his nose at the Harvard establishment and his rejection by the elite Harvard Clubs. He takes a simple online directory system called "The Facebook" and turns it into a place to rank Harvard girls by their looks. The concepts spreads like wildfire through the male-dominated campus and other Ivy League campuses due to a couple of simple facts. First, it's college, and these are kids. Second, it's the Ivy League, and these kids are pretty snobby for the most part (mea culpa). Now take that concept, add some sizzle from Napster founder Sean Parker, and you have the makings of a wildly popular place to share gripes, flames, rumors and scandal. Fast forward to 2012. Same thing, only now Facebook is in every Internet-connected household. My question - is Facebook so different now? I have to say no. As a marketer, I have a lot of "friends" I don't even know. When I first got active with Facebook, my brilliant, but not very original, idea was to meet a lot of influencers who would spread the word about Kuno Creative and our clients. How has that worked out? Not at all. Now I have about 1000+ people I have never met posting all kinds of personal things every day. Some of them I find amusing, so I "like" them and add comments. Business value, less than zero. I think we use our Kuno Creative page the right way—as a casual place to check out the people who work for us and some of our zany antics in the office. It's the online "personality" of the company. In fairness to our Facebook updaters, our Page does help prospective clients get to know us, which is valuable. For the most part, however, Facebook to me is becoming another MySpace, completely useless as a business channel. Maybe it was always that way—and certainly the Social Network reminds me of the old saw, "if it quacks like a duck..." I know, lots of other marketers have a different opinion. Certainly B2C companies get a lot of traction out of Facebook. For me, I would rather put my eggs in a different basket, like LinkedIn or Twitter for example. Don't try to make Facebook into something it's not. It's a fun place to hang out, swap stories and share photos. It's not a whole lot more complicated than that. There's always a good reason why something becomes so popular - because it appeals to people on a certain level. The boys in Zuckerman's dorm weren't trying to take the Harvard Business Journal online. They were trying to have some fun. And it worked.